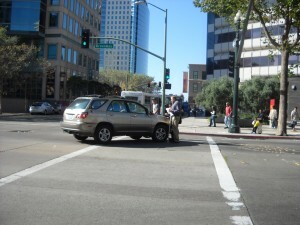 Protesters stop SUV in Oakland Wednesday. Broadway and 14th in Oakland gets some new decorations. Perhaps the most surrealistic moment at the General Strike in Oakland was a chat with Mayor Quan’s husband. He was scrambling to help her regain the goodwill of the protesters. 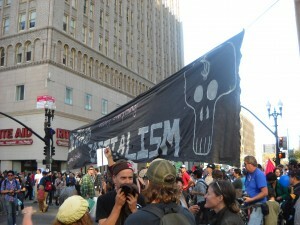 The atmosphere at the latest general strike was similar to that we noted at a previous visit to the L. A. County Fair, a few years back. 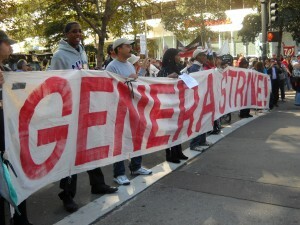 The last general strike in the USA started at 5 a.m. on December 3, 1946 in Oakland. Some businesses which were open at 8:30 a.m. on November 2, 2011, were closed later in the day. When given the choice of giving in to fatigue early and then posting some photos with a short roundup or staying longer and not being able to get to the Internets on the same day as the event, this columnist chose to get the photos posted at about 4:47 p.m. PST.